As usual, I got them really fast : I ordered the set on October 21st, it was shipped on the 24th and I had them on the 26th ! Always less than a week, even though the shipping to France is now via Colissimo and not via UPS anymore. Or so it seems, we'll see how it goes with my next order. Once again, I got my products with a Hollister offer : free shipping on all orders and a "3 for €21" discount. So, even though the Gift Set costs €19 online alone, if you take 3 Gift Sets, the three together will cost €21 - isn't that great ? The offer isn't available in store for the Gift Set though, at least not the one I went to, at the Beaugrenelle mall in Paris - there aren't even testers for the Set - so you'd better buy this off the website in that case... which is what I've done and everything was pretty well wrapped up with big bubble wrap. And as I'm writing this, shipping is free for every Hollister order ! The set has two body mists : the first one is Raspberry and Magnolia ; a mix of raspberry, magnolia and mandarin. It's way punchier and even more original than the other one. At the beginning, you can really smell the mandarin because it's strong and even though I'm not a big fan of this kind of citrus scent in my perfumes (except for lemon), I like it here. When the body mist settles and I don't think about it when I've been wearing it for quite a while, I finally smell raspberry but I can't really find a flowery scent to this mist. Also, it is very, very longlasting and I'm kind of surprised because after 9 hours at work, I could still smell it very well on my naked skin - not on my clothes, on my skin ! Even though I'm not a big fan of citrus, I am in love with my Strawberry & Sandalwood Body Mist : a mix of strawberry, sandalwood and jasmine. I can't really tell there's jasmine in it but the mix of strawberry and sandalwood is pure genius. It's very original and even though my nose took a few seconds to get used to it, I have to say I am moved by this new awesome scent. It's sugary and wintery at the same time and I'm having a hard time telling you exactly how amazing this is and what it smells like because I'm so out of my comfort zone wearing this - it really doesn't smell like anything I've ever smelled. Pure genius. Just like the Raspberry body mist, this resembles a perfume rather than a body mist. It's not too girly and young, still more than the raspberry body mist and it slightly reminds me of candy. 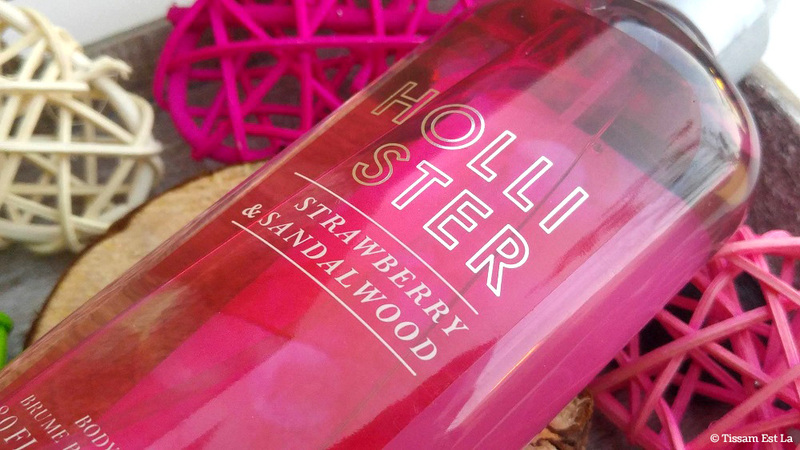 I can't say which of the strawberry or sandalwood I can smell the most, I'd say this is fifty fifty. What I can say is that it is also really, really longlasting - after a good hard day of work, I can still smell it on my skin : I suspect sandalwood does that. 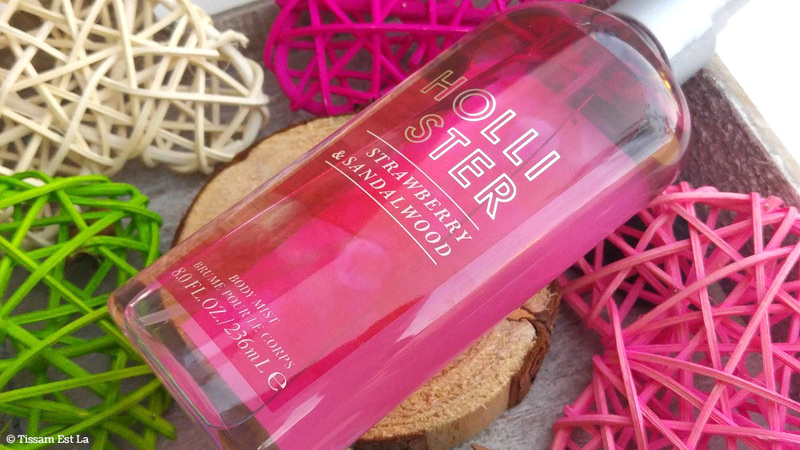 Anyway, once again I can't believe just how longlasting this is, especially for a Hollister body mist. I'm really happy and crazy about this Gift Set and I think the So Cal brand really has done an amazing job - they are so longlasting and these very original scents are perfect for any season and women of any age. So, I'm really happy I chose to offer one of you one of these gift sets before I even knew what the body mists smelled like and today, I'm launching the second giveaway on Tissam Est Là, which will go on until Saturday, November 26th and is open to every country in the world. - Comment below giving me your Facebook account. I'll check each participation on November 26th ! May the odds be ever in your favor !